Originally published under the title "Turkey: Record-Breaking Purge in Academia." 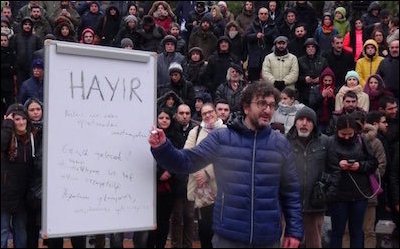 Professor Yuksel Taskin, one of 330 academics recently purged by Turkey's Islamist regime, gives a free lecture on democracy at a park in İstanbul afterwards. A Turkish university these days, expanding on historian Shelby Foote's famous quip, is "just a group of buildings gathered around a library," a mosque, and classrooms cleansed of unwanted scholars. The "Great Turkish Purge" launched by President Recep Tayyip Erdogan's Islamist, autocratic government in the aftermath of a coup attempt in July surprised many in its size. It should not have done. The failed putsch gave Erdogan's government a golden opportunity to advance his crackdown on dissent of every kind. No wonder Erdogan, on the night of the attempt, said: "This [coup attempt] is a gift of God." In its annual "Freedom in the World" report, the Washington-based Freedom House said on January 31 that Turkey suffered the largest decline in freedoms among 195 countries over the past year. Turkey's aggregate score declined 15 points to 38 out of 100 (the most free) -- from having been in 53rdplace in the 2016 report. It did manage to maintain its "partly free" status together with 59 other countries. "[A]n attempted coup in July... led the government to declare a state of emergency and carry out mass arrests and firings of civil servants, academics, journalists, opposition figures, and other perceived enemies," the report said. According to Freedom House, Turkey suffered the world's largest decline in freedom over the past year. An estimated 91,658 people are being detained and 128,398 have been sacked in Turkey's purge. One of the purged, Professor Yuksel Taskin, from an Istanbul department of journalism, tweeted: "This is a pure political 'cleansing.' But my conscience is clear. Let my students know that I shall never, ever bow down!" Widening more by each and every decree, this is now a country resembling Germany of 1930, which ended up chasing out its elite beyond its borders. What I know for certain, that there will no longer be any possibilities for our academicians 'cleansed' to find work and, live in decency and honor.